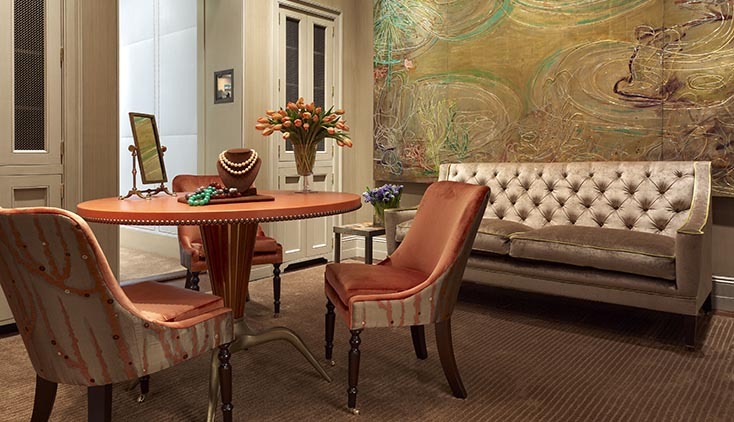 The main gallery at Mish New York features a painting by artist Nancy Lorenz, a sofa by George Smith, a 1950s Melchoirre Bega table with a custom made orange leather top and set of velvet Soane Britain chairs. The Blue Room at the Mish New York boutique are covered in a Clarence House suede with a nailhead trim. The same color blue was found in Edelman leather and used for the custom-made table top of the vintage French desk and the fabric seat cushions of the antique side chairs. Detail shots of the Blue Room at the Mish New York boutique. 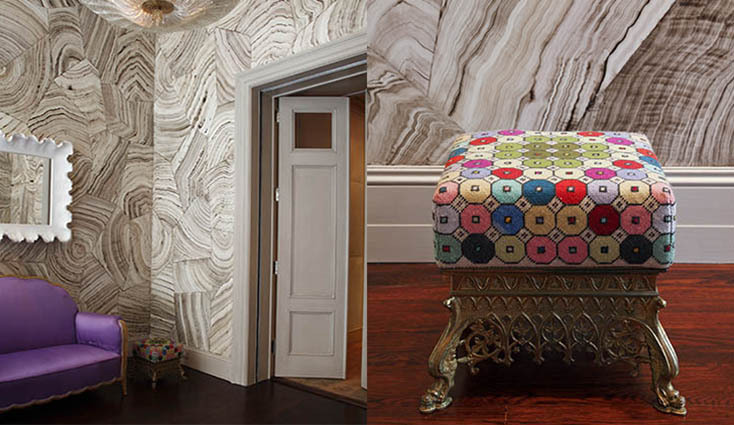 The foyer at the Mish New York boutique has hand painted walls, an art deco sofa, a nineteenth century tapestry stool and a mirror from Albert Hadley's estate. 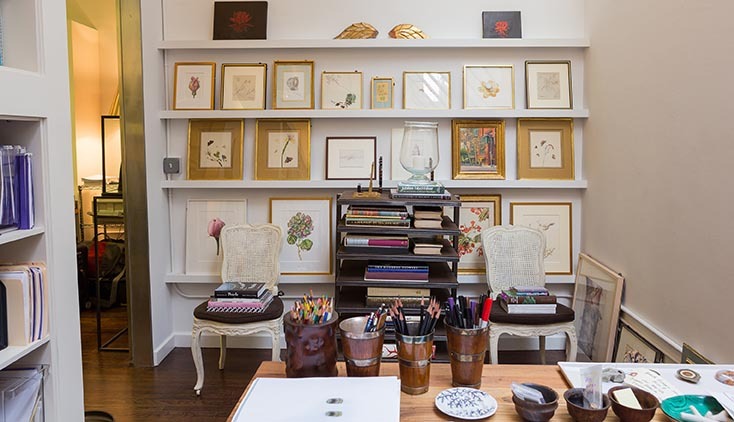 A gallery wall of botanical drawings in Mish's studio. 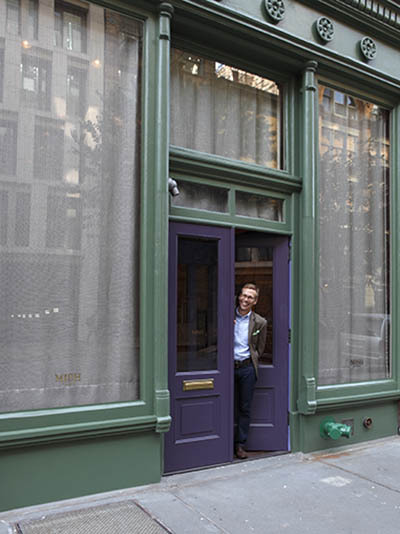 Designer Mish Tworkowski’s glorious boutique on Bond Street in the NoHo neighborhood of Manhattan opened six years ago, but don’t feel like you are out of the loop if this is the first time you are learning about it. It’s a well-kept secret. There is no jewelry shown in the windows. It’s a special destination, known by an exclusive list of clients that has grown steadily over time, mainly through word of mouth. The boutique (seen at right with Mish standing at the purple lacquered door) is ensconced in nineteenth century building. The interior was designed by Mish’s partner, architect Joseph Singer, and decorated by the late Ina Lindemann. 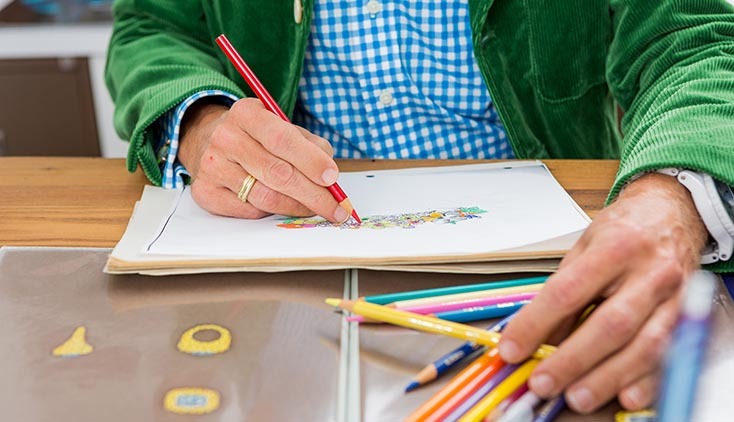 All of it is a perfect reflection of the Mish’s passion for gardens and his experience working as a specialist at Sotheby’s, his love of gems and enthusiasm for color. 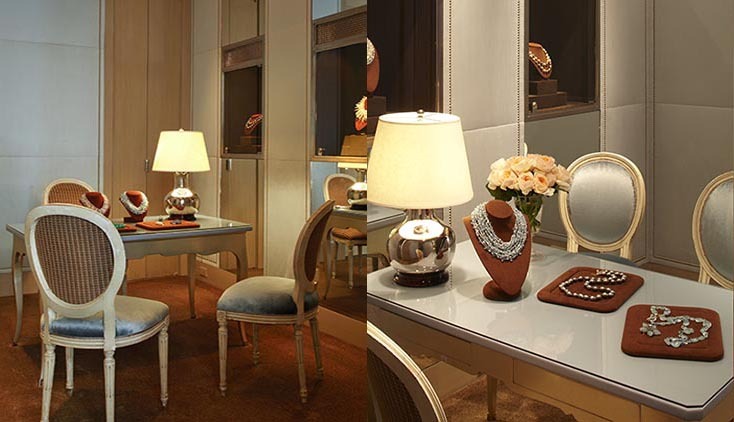 There are luxurious little details throughout the space like rock crystal and tiger’s eye doorknobs crafted by a German gem carver. Whimsical pieces of the décor were picked up at auction including a mirror from esteemed decorator Albert Hadley’s estate sale and a nineteenth century tapestry stool from Robert Woolley’s collection. 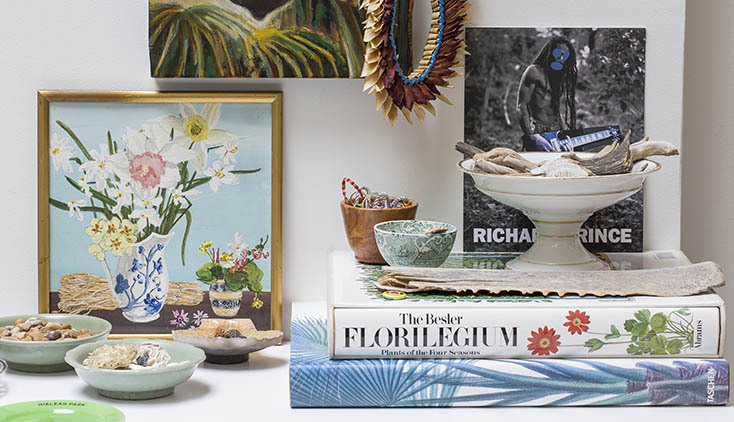 In the back of house space, there is a studio where Mish designs the collections surrounded by his books, objects and a wall of pictures with his beloved flowers. A friendly black Labrador named Moby roams the halls and keeps the staff company including an artist who makes a special watercolor of each piece of jewelry. 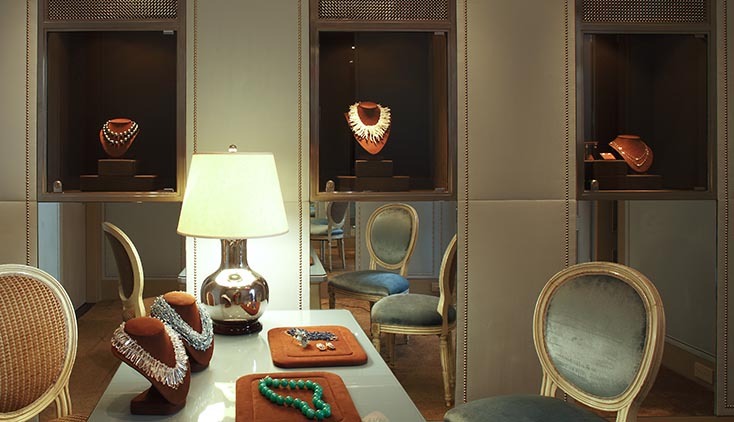 It’s a joyful haven or as Mish describes the boutique space “a luxurious coccoon” where clients are known to stay for an average of two to three hours while they are carefully presented the collection or collaborate on a new creation. Mish New York is located at 30 Bond Street in New York City, mishnewyork.com.